The lights were on and the sanctuary was filled to standing room only Wednesday night, Oct. 8, at Our Lady of Fatima Church, the former Bensalem parish that recently merged with nearby St. Charles Borromeo Parish. The occasion was the dedication of the site as the Fatima Catholic Outreach Center, where Catholic Social Services of the Archdiocese of Philadelphia and St. Mary Medical Center will work hand in hand to provide for the needs of the surrounding communities in Bucks County. The hour-long prayer service was led by Auxiliary Bishop John McIntyre, who told the congregation that the center, which will tend to the needs of the people including many of whom are Latino, was a sign of God’s care for his people. Several priests and religious sisters from the surrounding parishes turned out to show support for the center’s new mission, made possible through a partnership with St. Mary Medical Center. The liturgy reflected the unity of the people with prayers and hymns offered in both English and Spanish. Other speakers included Greg Wozniak, chief executive officer of St. Mary Medical Center; Joseph Sweeney Jr., secretary for Catholic Human Services of the archdiocese; Bensalem Mayor Joseph DiGirolamo and Msgr. Edward Deliman, pastor of St. Charles Borromeo Parish. Although the center offers many programs, Wozniak said that the staff is already mapping out plans for the future that include offering services to senior citizens and, by next spring, planting a community garden. DiGirolamo told the congregation that the center would be another venue to bring the people together and help each other. Catholic Social Services has been ministering to the needy for more than 200 years, and will continue to “go where the need is,” Sweeney said. The center will offer such services as a food pantry, English classes, document assistance, pre-teen leadership program, cooking lessons, after-school tutoring and recreation sessions, a diaper bank and a prenatal support group for expectant mothers. Toward the end of the service, Bishop McIntyre blessed a wooden crucifix and hung it on the wall of the hallway just outside the sanctuary, signaling that the center was officially open. At a reception following the ceremony, the congregation filled the hallway to feast on Spanish food and socialize. Levittown resident Ernesto Aguilar, his wife Imelda and their children Stephen, 14; Valentin, 11; Esteban, 13 and Marco, 6, enjoyed the food and picked up brochures that outlined available assistance. 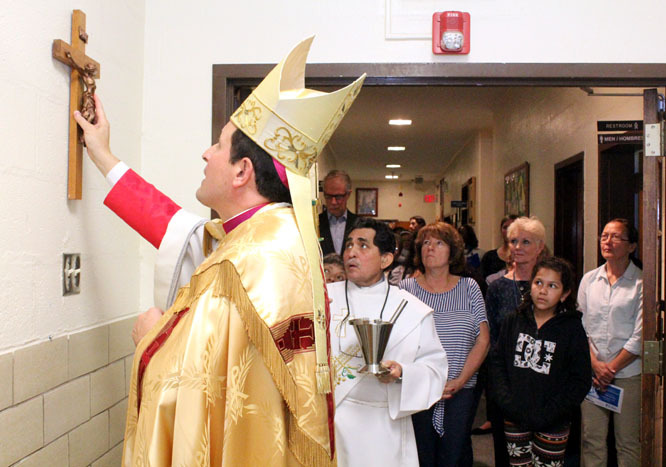 Ernesto, who belonged to the former Our Lady of Fatima Parish before moving from Bensalem, expressed his belief in the importance of instilling the faith in the young. He learned his Catholic faith in his home country of Guatemala and he wants to continue the tradition in this country. It was good, he said, to see Our Lady of Fatima reopen to a new life. Msgr. Deliman credited “many hands” working together to make the center possible. “My fear was that, had the church been shut up, it would have meant abandonment of the Latino community. This is not only a spirited center but a center for human needs,” he said. Elizabeth Fisher is a freelance writer in Bucks County. Hi, What different social services does this center offer, please? Also, when is the food bank open & when are the cooking classes please? Are they free? Would I have to register anywhere for the food bank and/or any of the services? What other services are offered here, please? Are there any Catholic Masses offered on Sundays, (Or for Sunday intentions, like a Sat. Vigil Mass??)) at this location, and are any in English? If so, what times, please? (Or English AND Spanish?) Thank you. Are there any adult programs here and if so what? What “Senior” programs are offered and what age is considered “Senior”, please? Thank you.